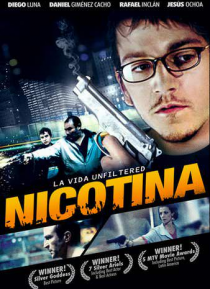 From the producers of AMORES PERROS comes the crime caper NICOTINA. Lolo (Diego Luna) is a computer hacker who teams up with two amateur criminals in a deal with a Russian mobster. Diamonds will be exchanged for computer access to certain Swiss bank accounts. Although dangerous, the job is fairly simple for tech-savvy Lolo. What nobody plans on is Lolo's distractive obsession with a woman...at a m… ost inconvenient time.